Last weekend Elizabeth appeared on Britain’s Got Talent (video embedded). The performance appeared to fill the theatre, and it did indeed ‘play big’ – However, something more intimate and clever was going on. The effect was essentially a mediatised one-on-one performance; a frame within a frame. Amanda Holden had the experience, and the larger audience in the theatre were seeing essentially what we were as a television audience (albeit without the judges reactions). The theatre audience were a large watch party, we at home were watching both the party and the experience. Through this frame bizarre magick was able to simultaneously play small and big. Holden was the only one having the live experience. We only had the frame to respond to. This frame as all the more acceptable because so much of the piece played upon our accepted notion of the modern televised ghost hunt (think Most Haunted). Elizabeth’s look could easily be that of a presenter taking us through a haunted house (in this case ‘under the theatre’ (as pointed out by Ant and Dec). The camera team mimicking the shakey cam and the POV of the hunters of the haunted. The pay-off, the manifestation of Agatha Turner, was wholly theatrical, bringing us out of one frame and back to the theatre. The journey made more explicit and Holden and Turner/Elizabeth returned to the main stage.Layered into this we had the under-lit judges reactions. The music. The camera, becoming just at the right moment, Holden’s POV. 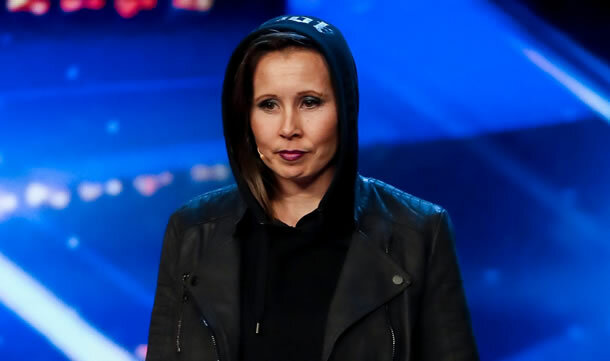 This was bizarre magick for BGT … I didn’t think it was possible. Nice one.